Former cabinet minister James Purnell has announced he will leave Parliament at the general election. The MP for Stalybridge and Hyde, Greater Manchester, said it was a "difficult decision", but he did not want to spend all his life in politics. 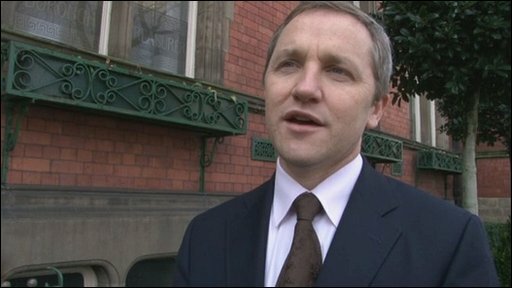 Mr Purnell quit as work and pensions secretary after last year's local and European elections, calling for Gordon Brown to resign as prime minister. Business Secretary Lord Mandelson said he was "sad" about him going as an MP. A former aide to Tony Blair, Mr Purnell has also served as culture secretary. He has been an MP since 2001 and is currently leading a project on the future of the Left for the think-tank Demos. In a statement, the 39-year-old said: "I have been proud to represent the people of Stalybridge and Hyde. And this has been an extremely difficult decision to make. But I have decided that I no longer wish to be an MP. James Purnell was a rising star within the Labour party: an innovative thinker and committed politician with real ability. He faced strong criticism when he tried to spark a leadership contest by quitting the cabinet and announcing it moments before the polls closed during the local and European elections. Since then Mr Purnell is believed to have become increasingly disenchanted with life as an MP and his departure will be a further blow to the Labour leadership - seen as another vote of no confidence in Gordon Brown. The message seems to be that he sees no immediate future in politics for himself - or his party. It is also bad news for Foreign Secretary David Miliband who, it was expected, might have wanted his friend and ally by his side if he were to launch a bid for the Labour leadership in the event of defeat at the election. "I have spent all my working life in or about Westminster. And while this has been a huge privilege, I've realised I don't want to have spent all my life in frontline politics. "I'm looking forward to completing my project at Demos. After that my hope is to contribute ideas to public service and to the Labour Party." Health Secretary Andy Burnham said Mr Purnell had made "an immense contribution to public and political life in this country". "James is a great friend of mine and a man of huge intellect and talent," he said. "He won't be completely lost to the Labour Party I'm sure, because he remains as committed to the party as he ever was. "I think he's obviously decided to pursue other options and I wish him well in whatever he chooses to do, but James is a great loss to frontline politics." Mr Purnell, once seen as a rising star in the government, surprised Westminster when he quit as work and pensions secretary after polls closed for the local and European elections last May. He called on Mr Brown to resign, saying his leadership of Labour made "a Conservative victory more, not less likely". Lord Mandelson told the BBC: "I'm very sad about James. He has been a very good member of our party and was an excellent minister. "But I realise that, given his age, he is looking to his future and wondering what he wants to spend the rest of life doing, and has opted for a different life. "Politics and Parliament will be poorer for that and I regret his decision very much." Mr Purnell was a researcher for Mr Blair from 1992 to 1994 and worked as head of corporate planning at the BBC from 1995 to 1997. The general election is expected to take place on 6 May.